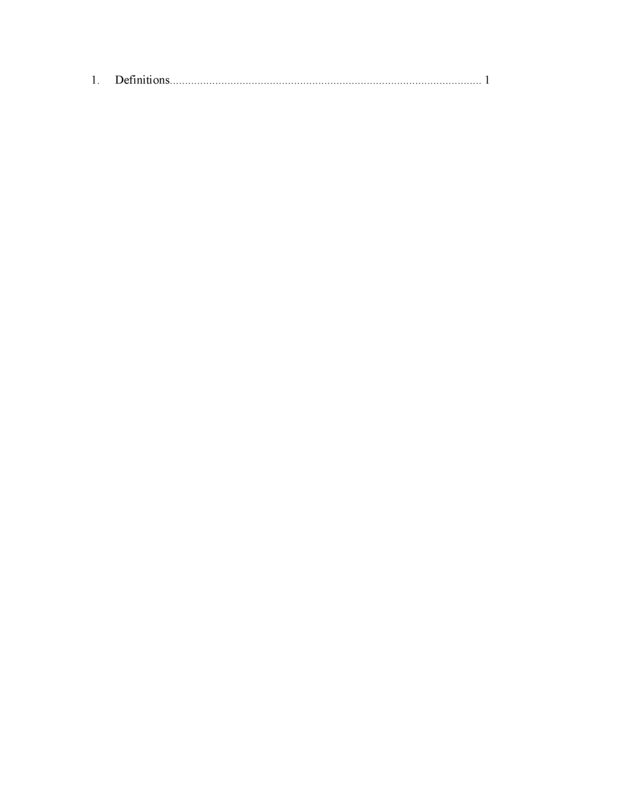 Some numbers are just too serious to ignore. 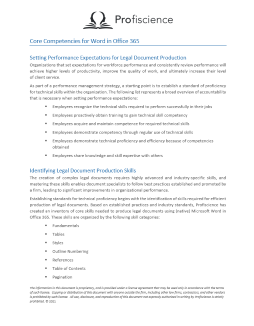 We've assessed thousands of legal document producers and this figure represents the average rate of proficiency for document production skills in U.S. law firms at a cost of over $9,000 per document producer each year. 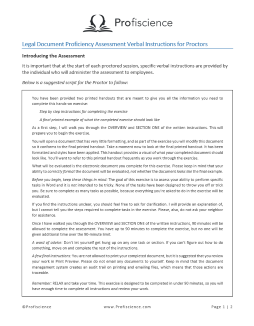 When developing our assessments, we always start by identifying the Best Practices for the application within the legal environment. 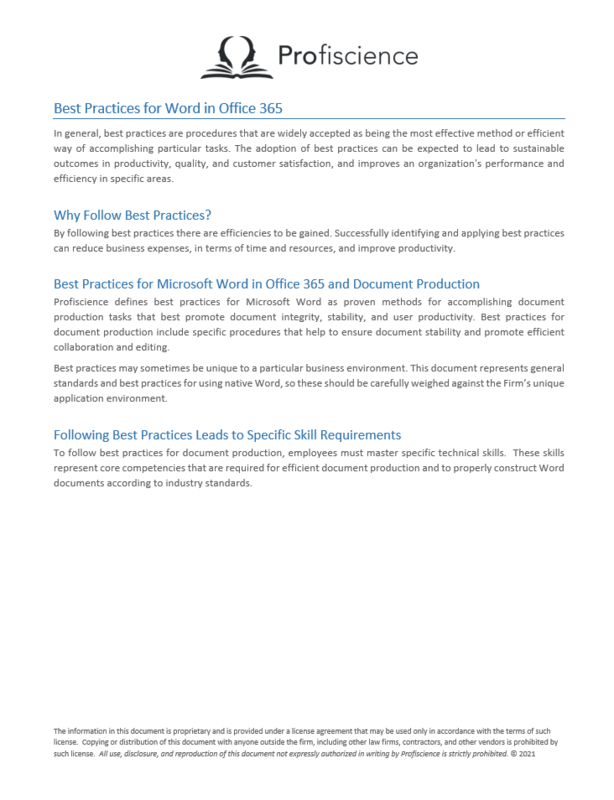 Best practices are procedures that are widely accepted as being the most effective method or efficient way of accomplishing particular tasks. 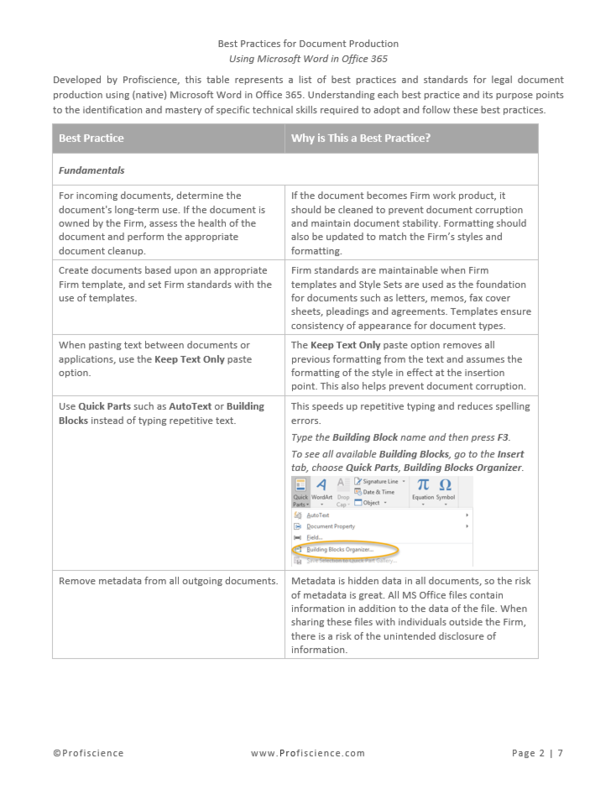 Successfully identifying and applying best practices can reduce business expenses, in terms of time and resources, and improve productivity. 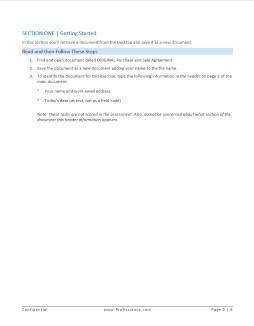 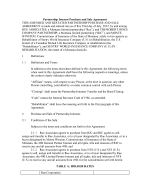 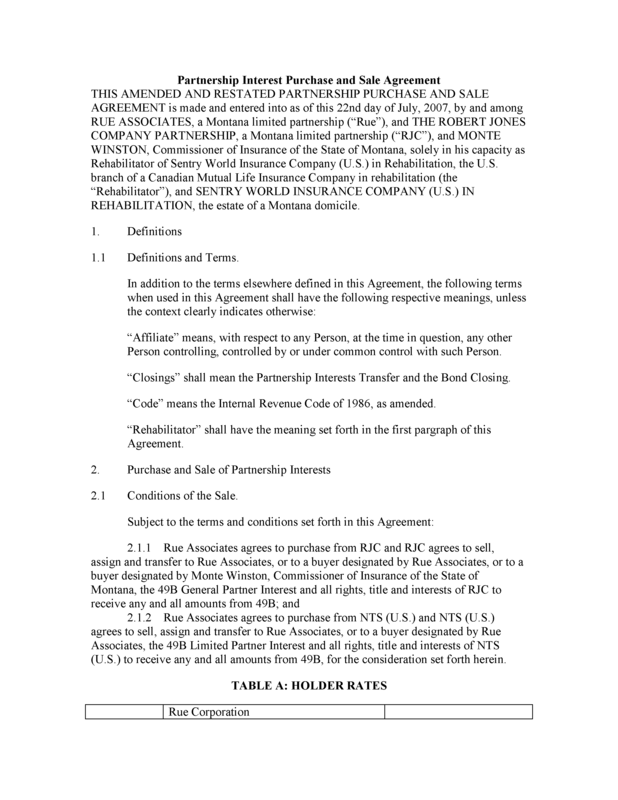 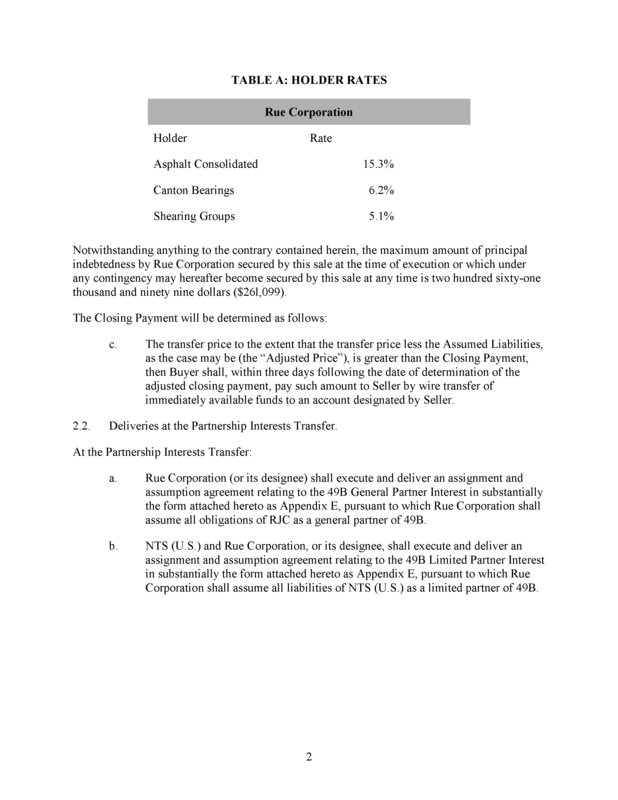 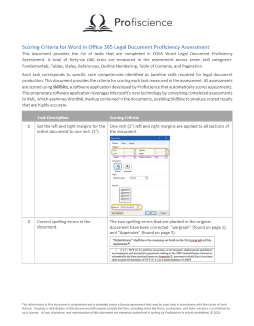 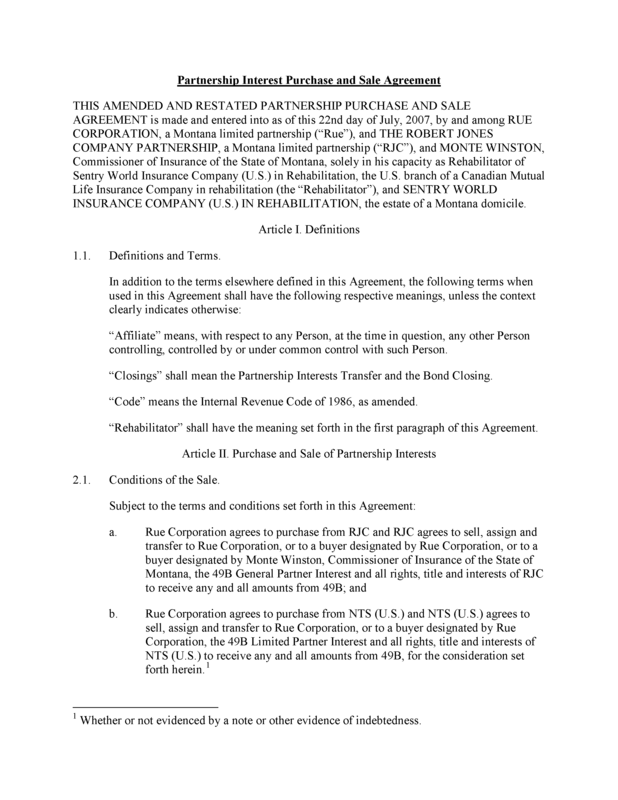 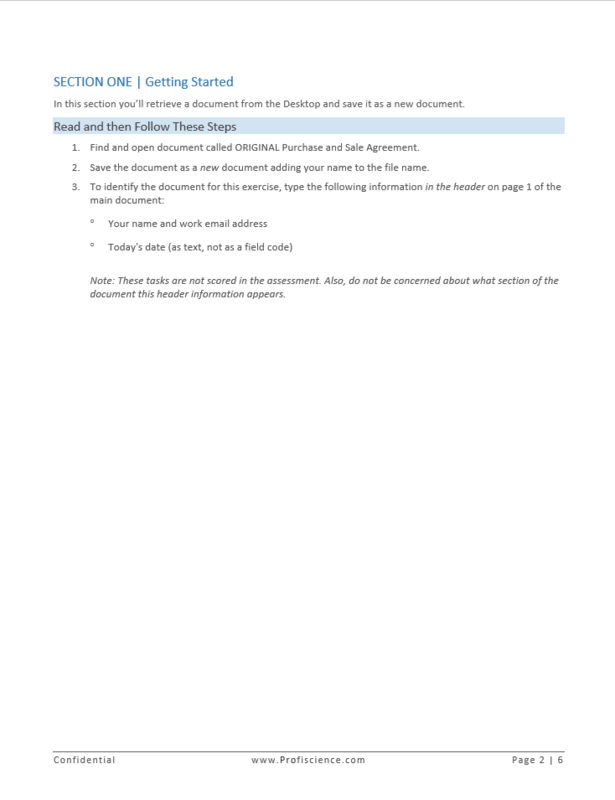 The snapshot below includes the first two pages of best practices for legal document production in Microsoft Word. 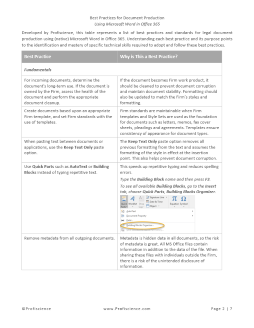 To follow best practices for document production, employees must master specific technical skills. 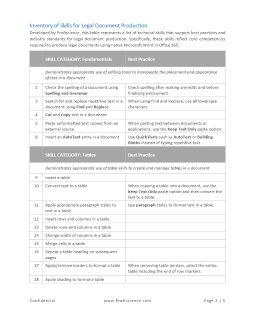 These skills represent Core Competencies. 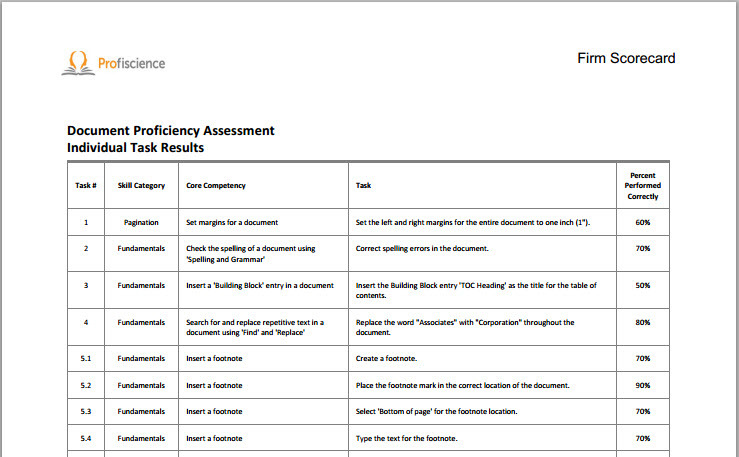 During the assessment, users are asked to perform specific Tasks. 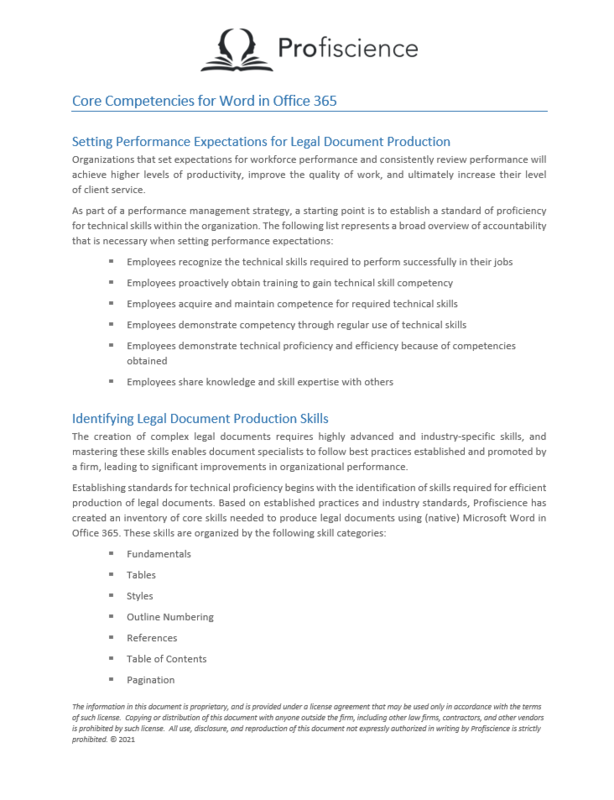 Each task corresponds to specific core competencies identified as baseline skills required for legal document production. 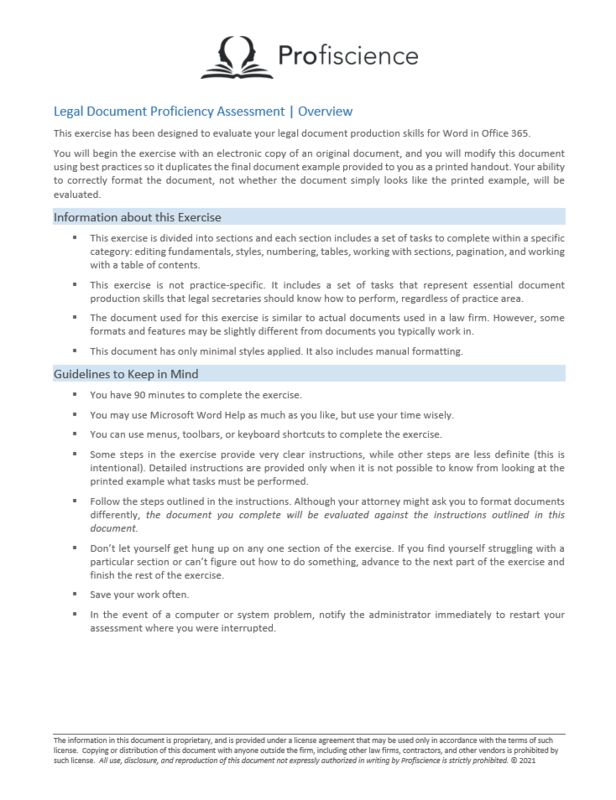 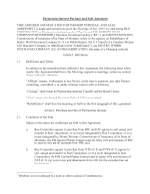 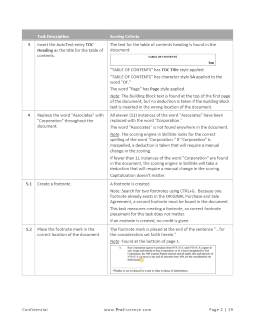 The snapshot below includes the first two pages of core competencies for legal document production in Word. 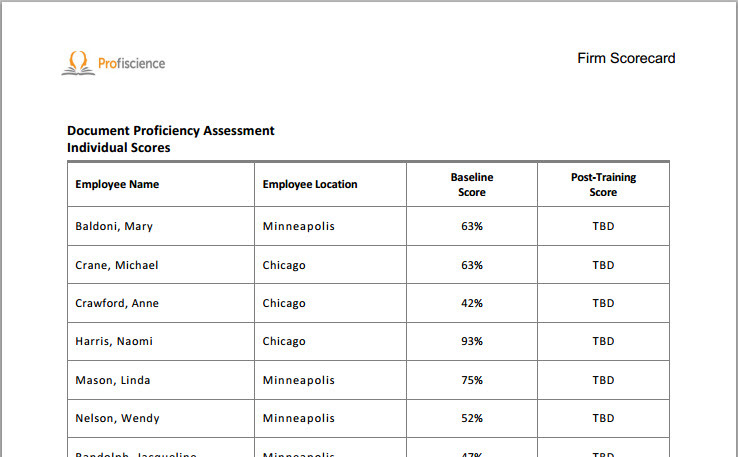 Identifying skill gaps is one thing. 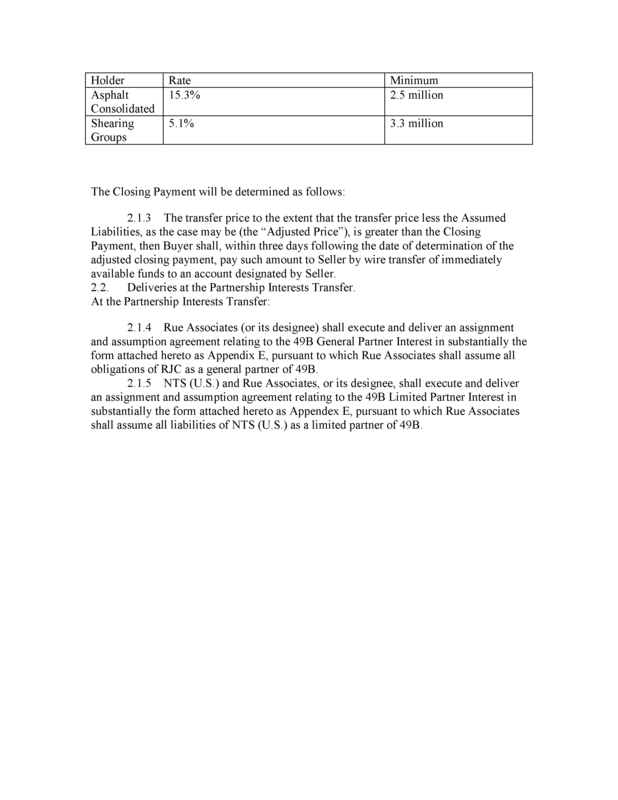 Closing them is another. 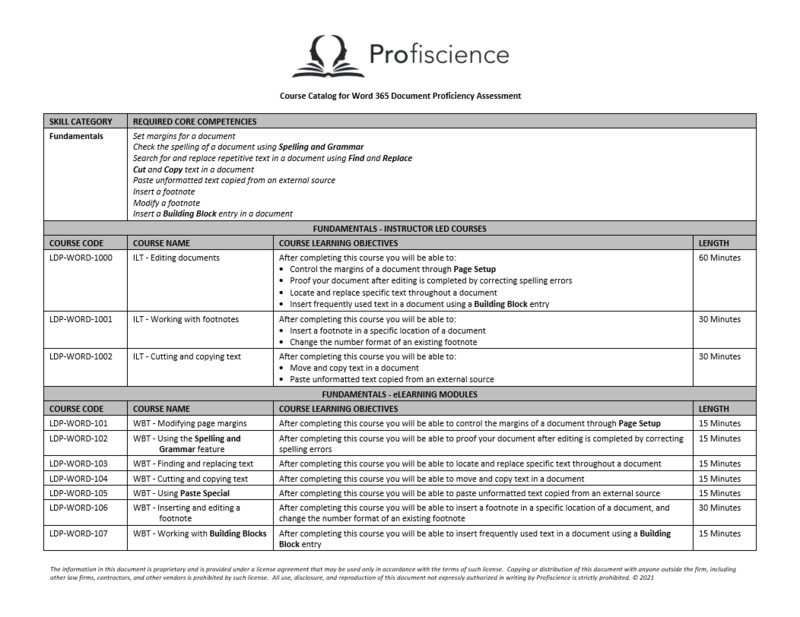 We help you create a Course Catalog with learning objectives that map directly to core competencies measured in the assessment. 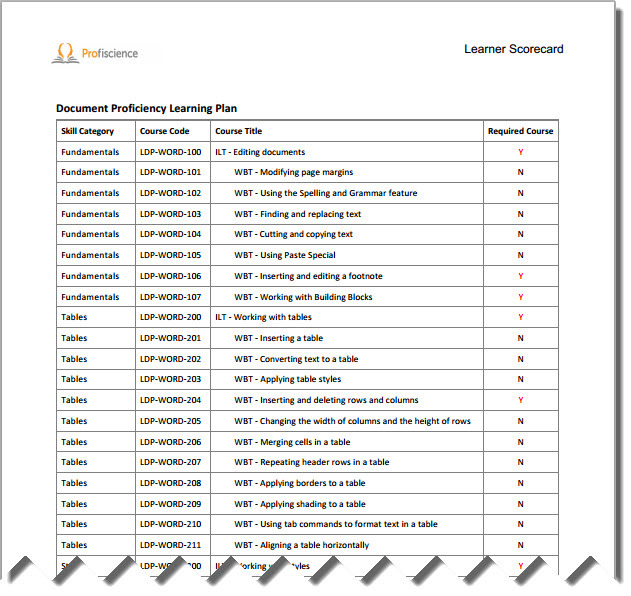 You're free to use your trainers, your curriculum, your eLearning or any third party resources you choose - our assessments prescribe targeted classroom training, webinars and eLearning mapped to your content. 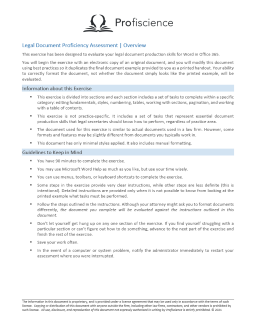 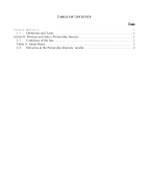 The snapshot below includes the first page of a catalog of courses for legal document production in Word. 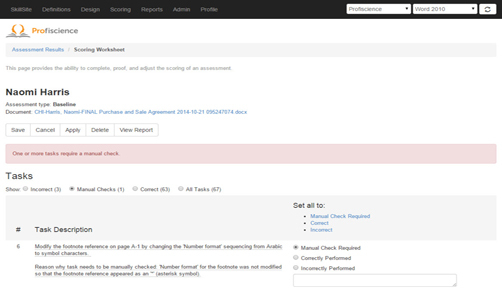 Assessments are completed in a proctored, secure area where interruptions can be minimized. 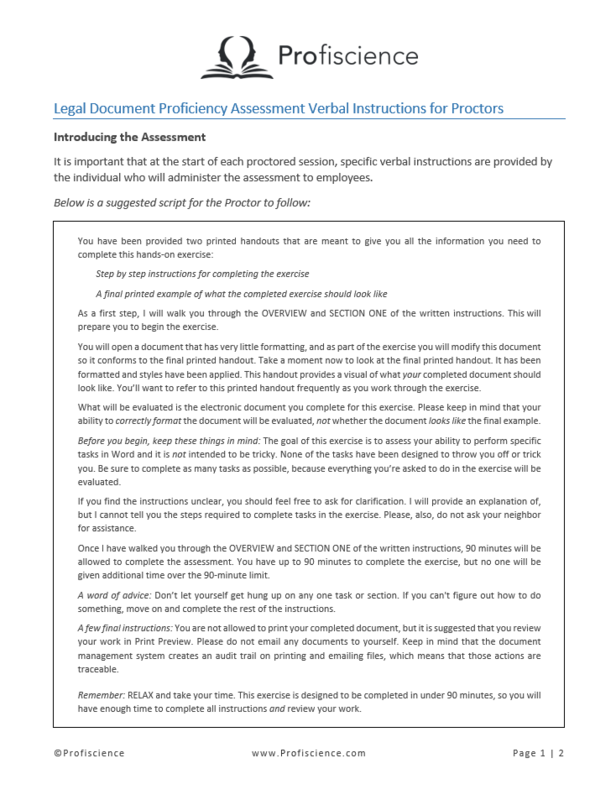 To ensure consistent verbal instruction during assessments, we provide a script for the proctors to read and follow. 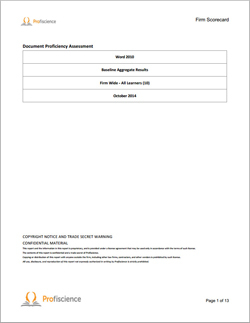 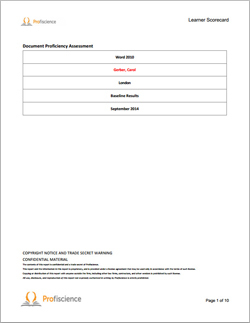 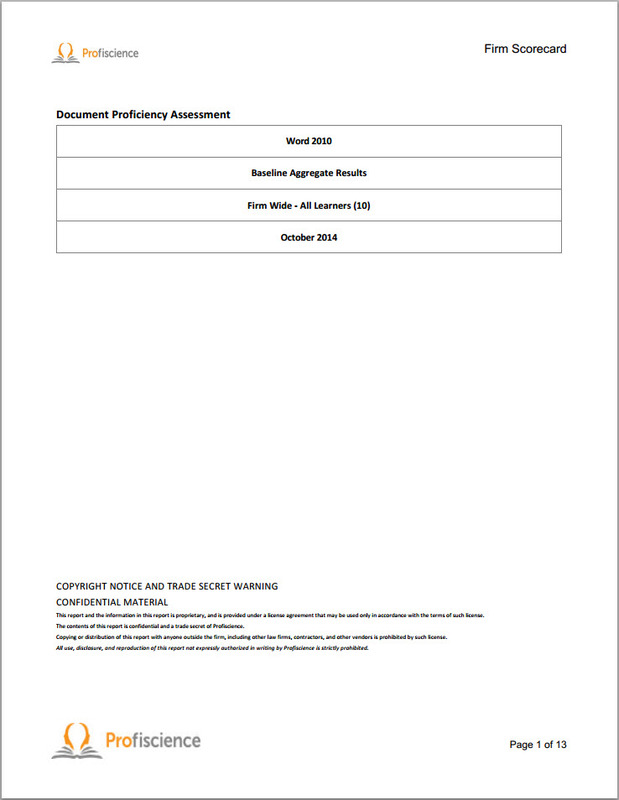 At the beginning of the assessment, users are presented with an electronic version of a poorly formatted document, a printed copy of the final document, and written instructions for transforming the original version into the final version. 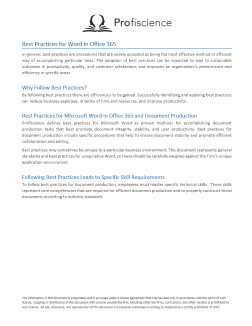 They can use the keyboard, mouse, ribbon - even your in-house or third party tools - so long as best practices are followed. 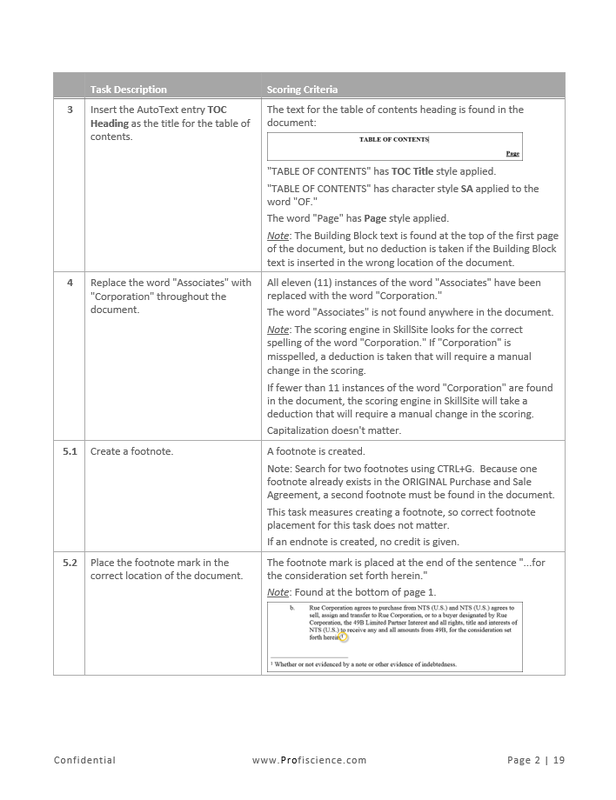 Users are evaluated according to their ability to correctly format the document, not whether the document simply looks like the printed example. 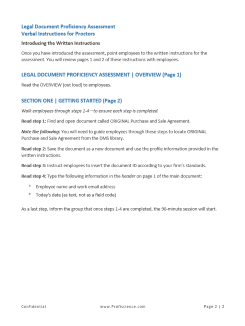 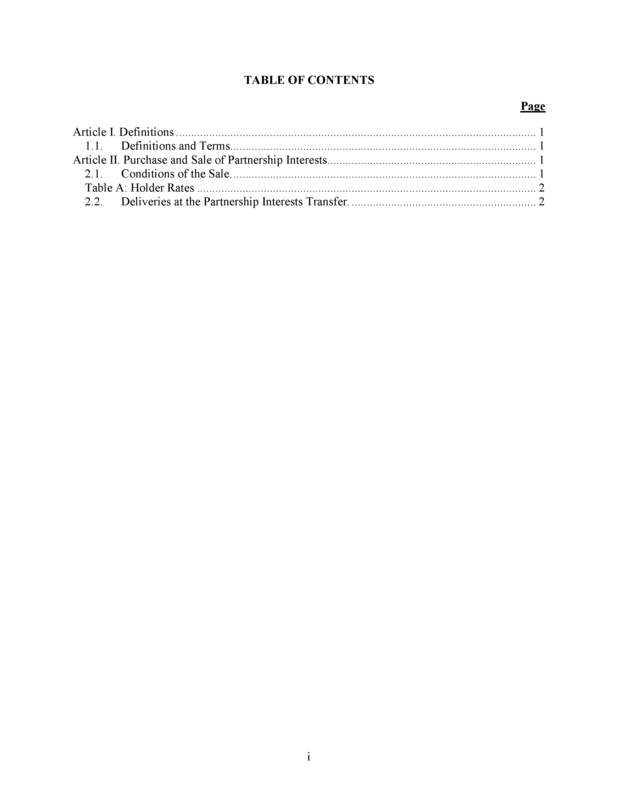 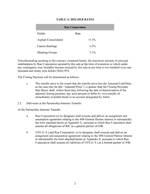 The written instructions guide the users through the steps required to complete the assessment. 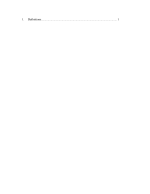 Some steps provide very clear instructions, while other steps are intentionally less definite. 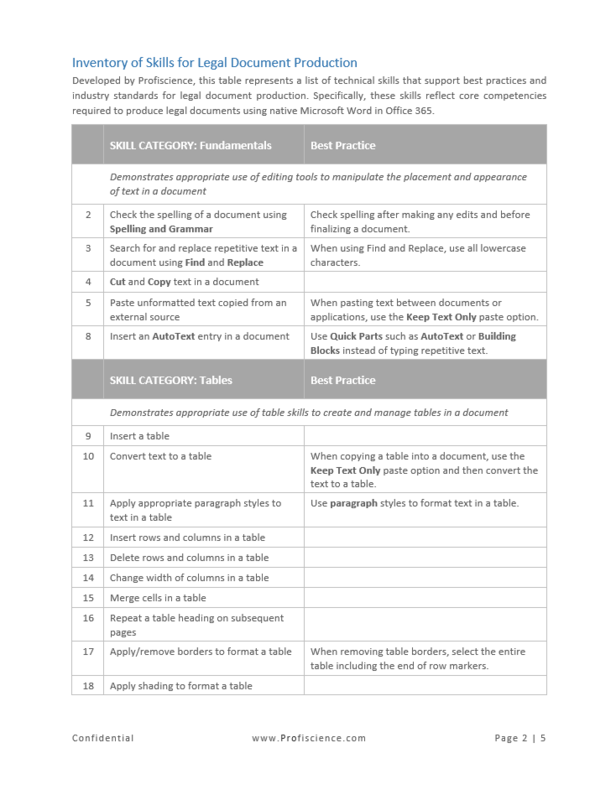 Detailed instructions are provided only when it is not possible to know from looking at the printed example what tasks must be performed. 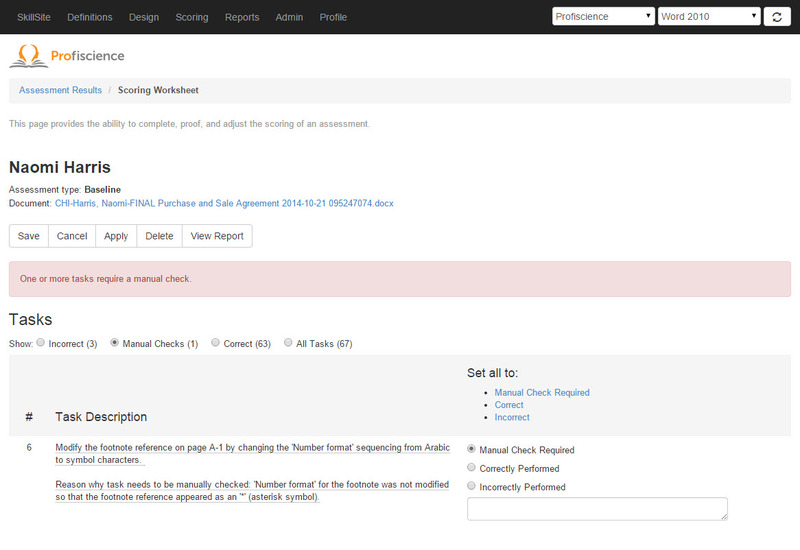 Our automated scoring engine does most of the work for you, but occasionally you may need to know what it's doing. 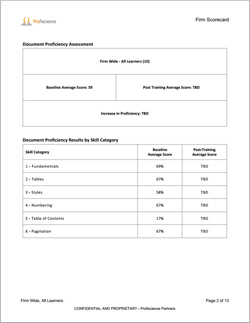 We provide documentation that itemizes each task measured by the assessment along with detailed information about what the scoring engine is looking for. 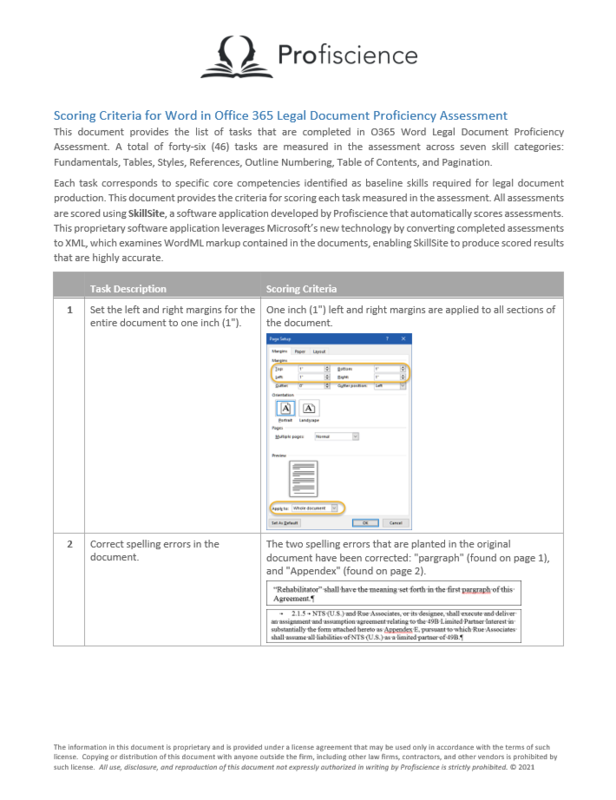 The snapshot below includes the first two pages of scoring criteria for our legal document proficiency assessment for Word. 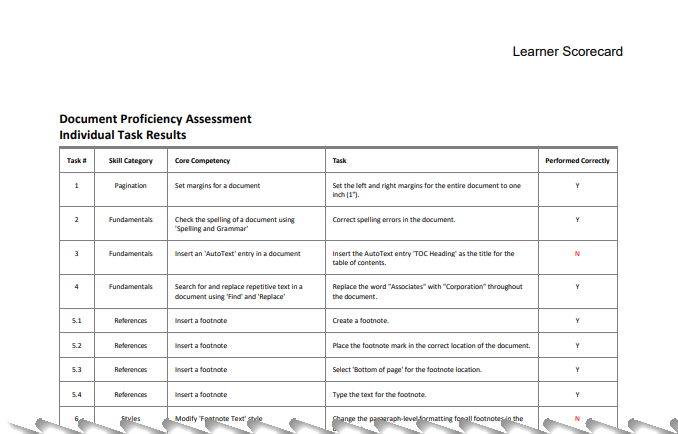 Completed assessments are uploaded to SkillSite where they are automatically scored. 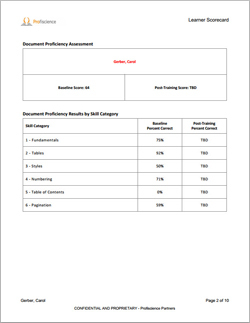 Uploading the assessments is usually done by the proctor in the training room immediately after the user completes the assessment. 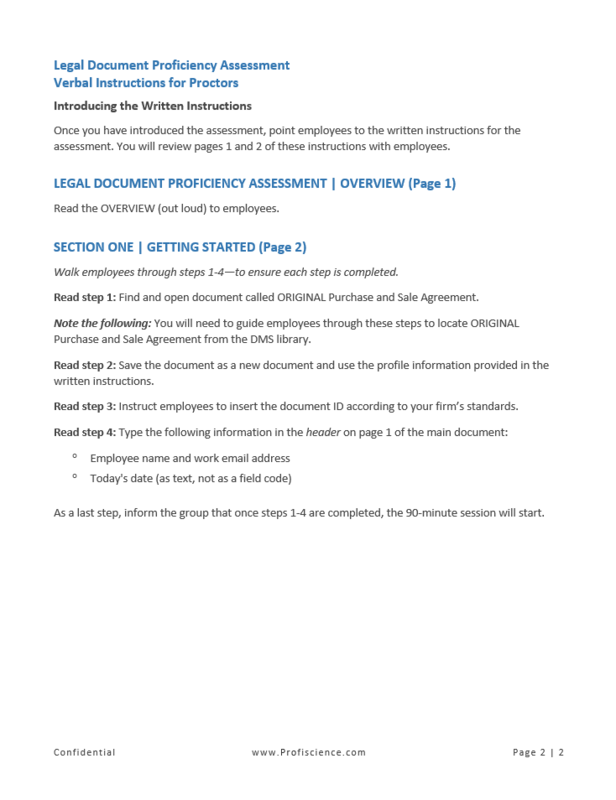 Depending on your firm's preferences, completed assessments can be saved to a secure location and uploading them to SkillSite can be assigned to someone other than the proctor. 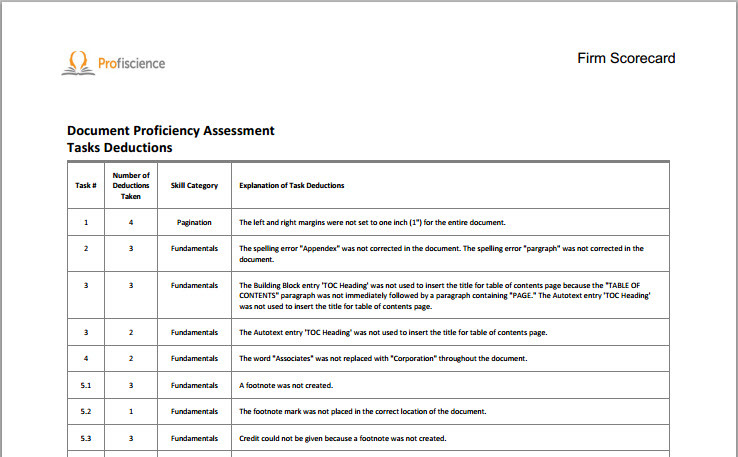 SkillSite automatically scores the assessments by reviewing the underlying document structure. 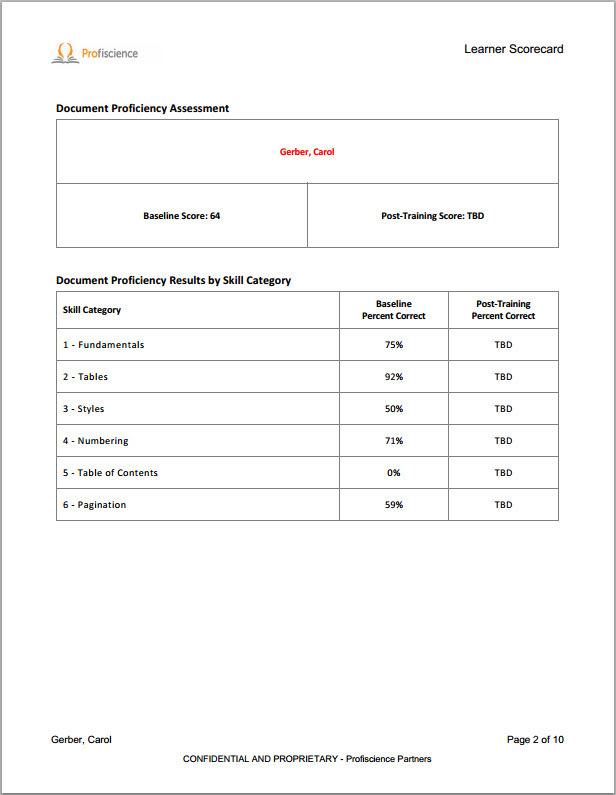 Although the scoring engine is extremely accurate, occasionally users will do something that the scoring engine doesn't recognize, triggering a manual check. 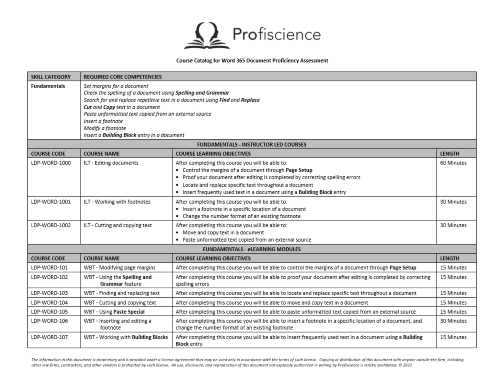 Manual checks must be reviewed and resolved online by your trainers using the Scoring Worksheet before an assessment can be finalized. 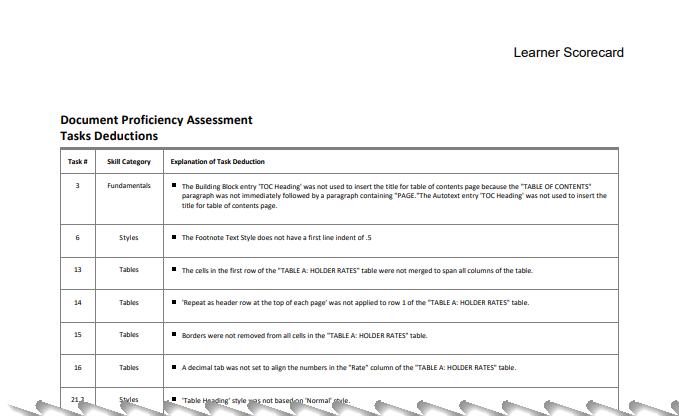 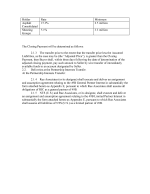 Trainers can also access the Scoring Worksheet to review why a particular deduction was taken. 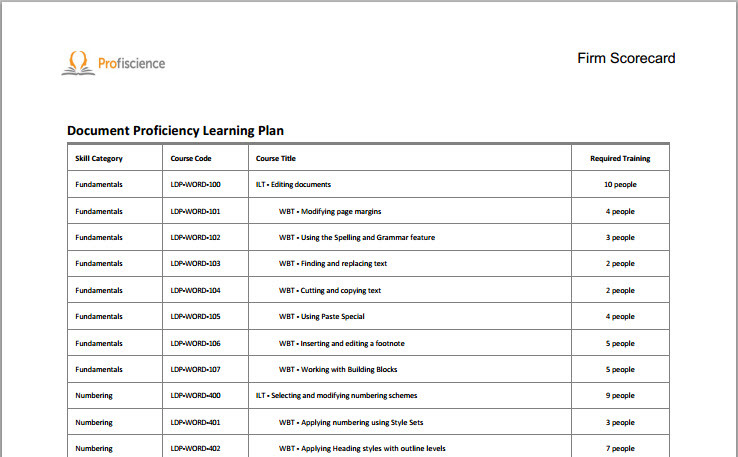 A user's Individual Learning Plan is based on deductions taken for specific Tasks related to Core Competencies. 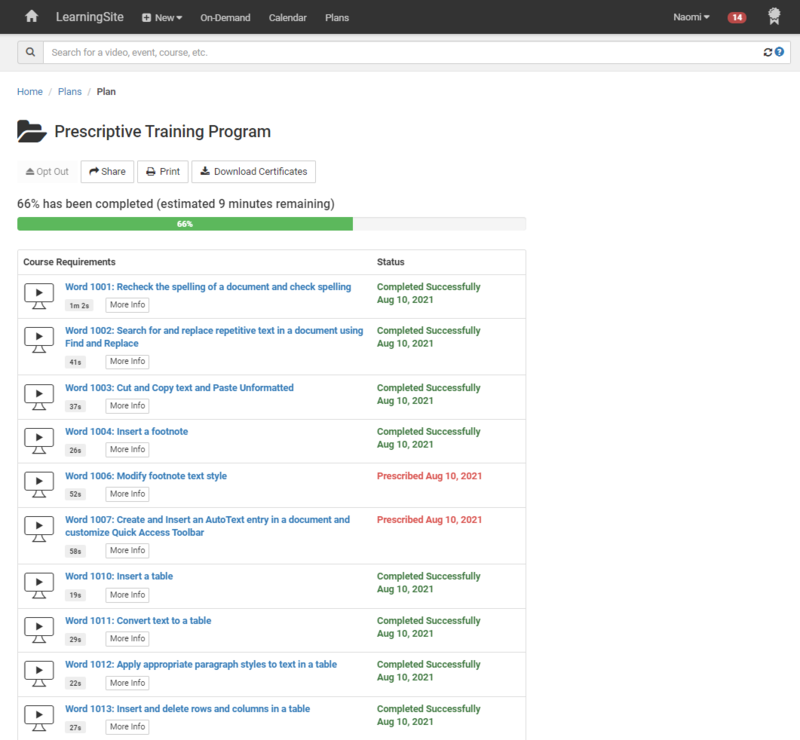 A scorecard is produced for each user listing skill gaps and outlining a personalized training prescription. After users complete their prescribed training and retake the assessment, the scorecard displays the baseline score next to the post-training score to show users how much they have improved. A certificate like the one below can be included in the individual scorecard for users who achieve a score of 90% or better. 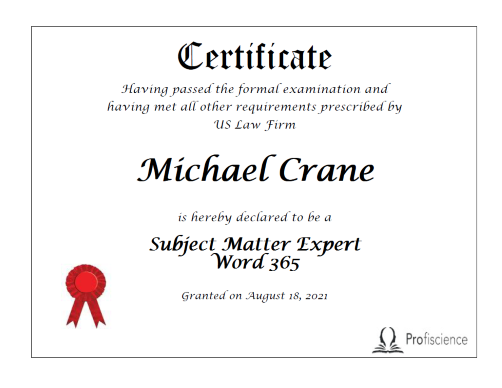 Most people certify after completing their prescriptive training. 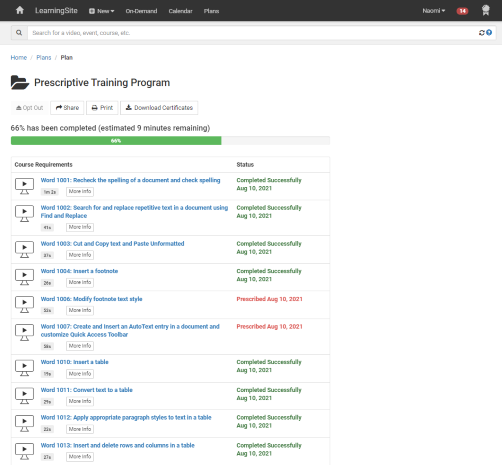 A few will be prescribed remedial training, but eventually the majority do certify. 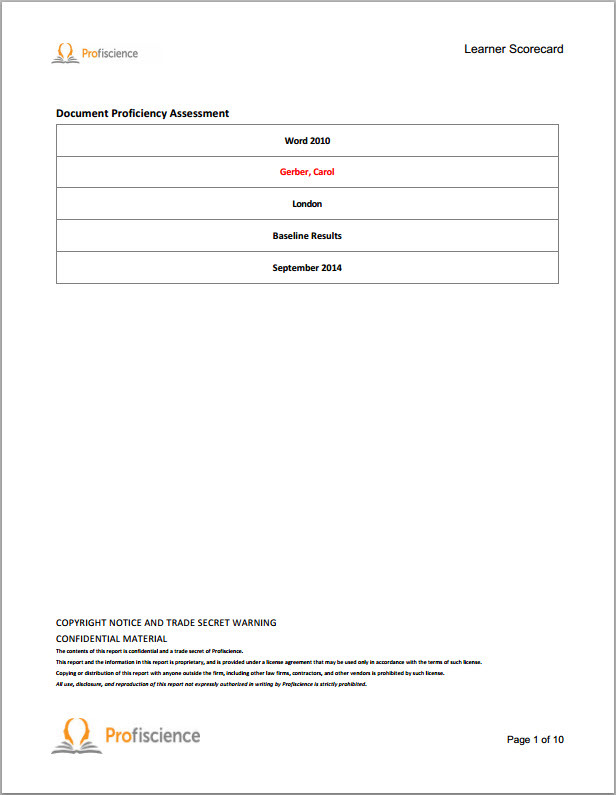 Assessment data can also be exported to Excel to create customized reports and even graphs to highlight important performance statistics and provide benchmark analysis. 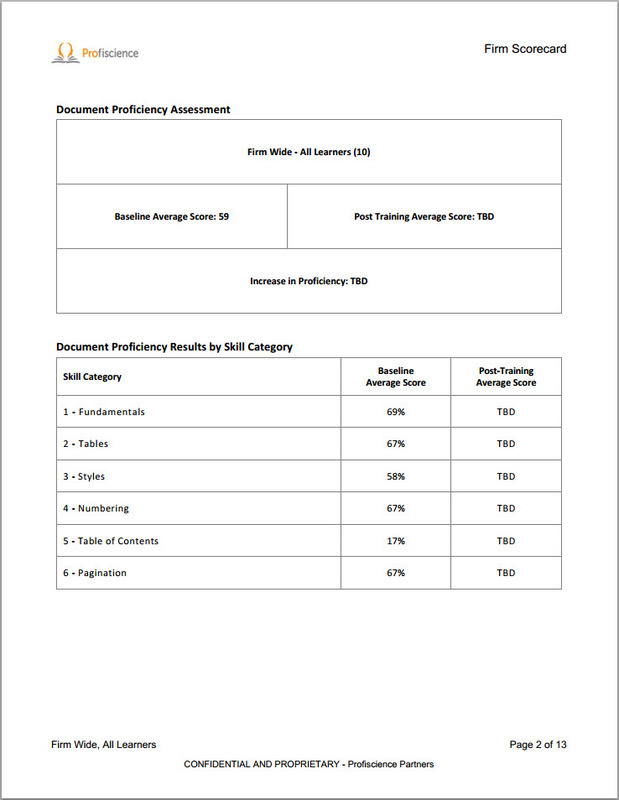 Once the assessment results are imported from SkillSite into UniversitySite, Learning Plans are created automatically for each user. 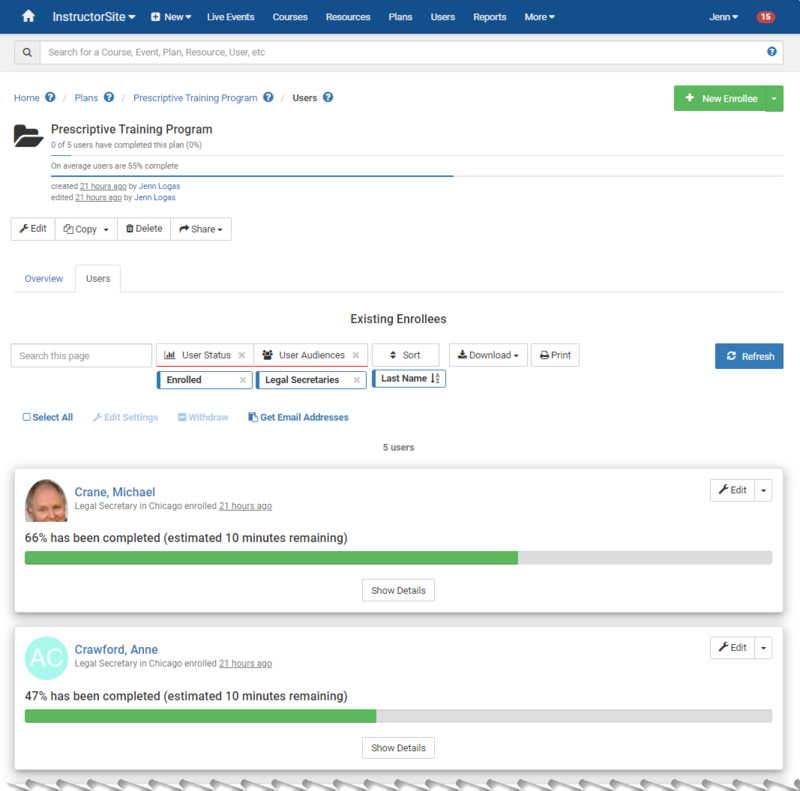 LearningSite guides users through the process of completing their learning plans and closing their skill gaps. 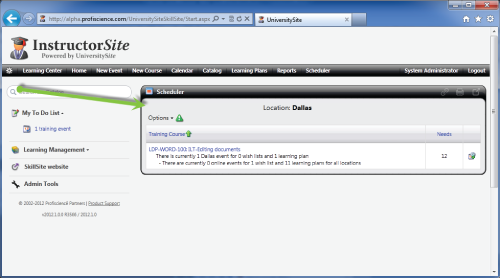 As users attend training or complete eLearning modules, their learning plans are automatically updated. 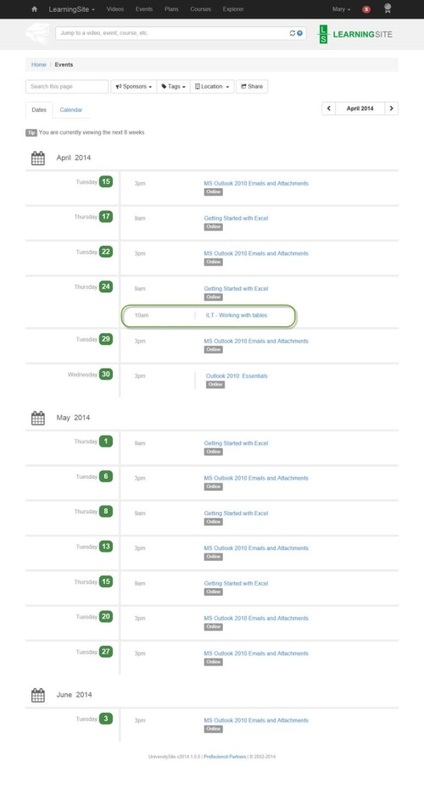 Because the imported assessment results automatically assign users to courses based on tasks performed incorrectly during the assessment, trainers will know exactly which courses, and how many classes of each course, need to be scheduled. 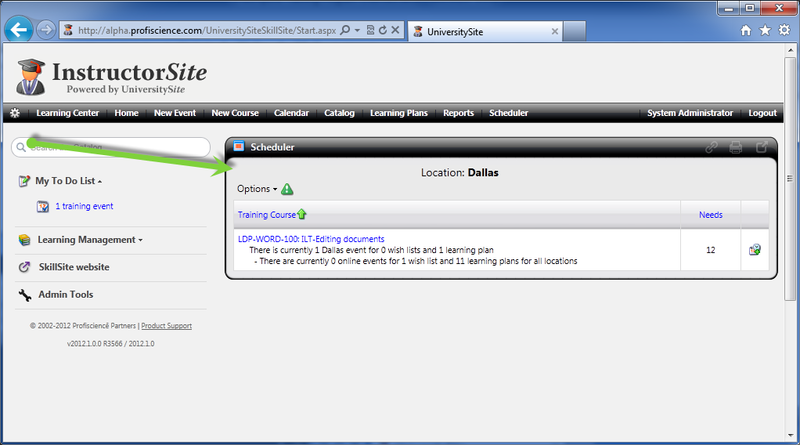 In the example below, the scheduler shows that 12 users in Dallas need an instructor-led class (ILT) for editing documents in Word to complete their learning plans. Scheduled classes and webinars can be included in LearningSite's calendar. 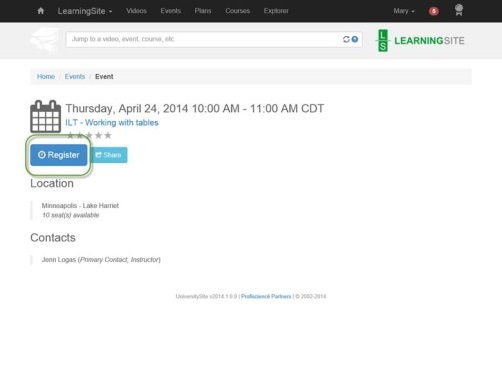 Users can get information about the class and can even register for it directly from the calendar. 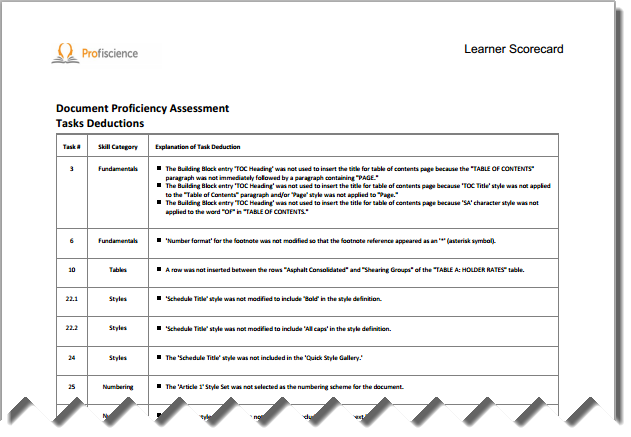 Project managers have continuous access to metrics showing how many people have completed their learning plans.